Serving the Hudson Valley Since 1929. COME ENJOY A SLICE OF HISTORY! 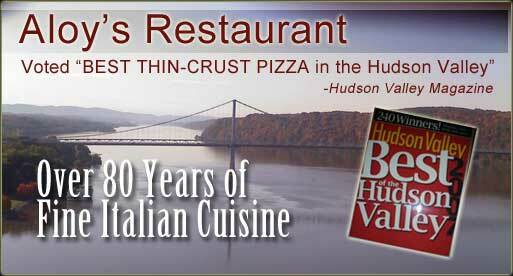 We are Ranked #7 in the Entire Nation for Being Among the Oldest Restaurants in the USA Serving Pizza…and WE ARE the Longest Standing in the Hudson Valley!! Our Recipe Has Remained Intact & Has Satisfied Over 3 Generations of Patrons!! We Are the Perfect Restaurant for Those Seeking Exceptional Italian Food, Award Winning Pizza, and Friendly Service in a Relaxed Family Setting. Visiting The WALKWAY OVER THE HUDSON BRIDGE? We Offer FREE PARKING to Customers Visiting the Bridge, We Are LOCATED JUST 500 FEET FROM THE ENTRANCE TO THE BRIDGE! Our own Aloy’s Pizza Sauce and Mozzarella Cheese over a Gluten-Free Crust. We Have TWO Private Rooms Available, and a Professional Staff Which Can Accommodate Your Specific Needs. Our Prices Are the Most Competitive in the Area, and Our Food Tastes the Best Because it is Prepared From Scratch With the Freshest of Ingredients, Then Cooked by Highly Trained Culinary Chefs. Whether you are planning a personal party for any occasion, or business meeting for your company, WE PLEDGE TO MAKE YOUR AFFAIR A SUCCESSFUL ONE!